A filter is a passive tuned circuit that presents a low impedance “sink” to currents at a given frequency or frequencies. Filter on the Equipment Palette inserts a filter in the one-line diagram. The application of harmonic filters can cause the creation of parallel resonance below the filter tuning point (single tuned notch). The filter must be designed to minimize the impact of this resonant point. For filters, the program automatically assigns the names FL-1, FL-2, FL-3, and so on. You can select from four different types of filters. 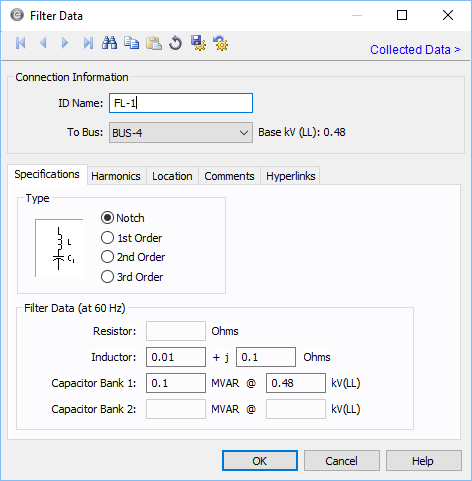 When you choose the type of filter, EasyPower makes unavailable any filter data fields that do not apply to the selected filter. Resistor Resistance of resistor of the filter in ohms. Inductor Real and imaginary impedances (ohmic resistance and inductive reactance) at system frequency in ohms. Capacitor Bank (1 and 2) The reactive power of capacitors for the system frequency in MVARs at the voltage level specified in kilovolts.